The field of petrochemicals started some years ago with the simple addition reaction of water to propylene for the production of isopropyl alcohol. Currently, the petrochemical industry has become a multi-billion dollar enterprise which encompasses a wide field of chemical products. Almost all the basic organic reactions such as hydrogenation, alkylation, substitution, polymerization, etc. are utilized for the production of these chemicals. It may not, however, have been possible to establish this huge industry without the use of different catalysts. In other words, the great advancements in the catalytic area have supported the vast developments in the petrochemical field. 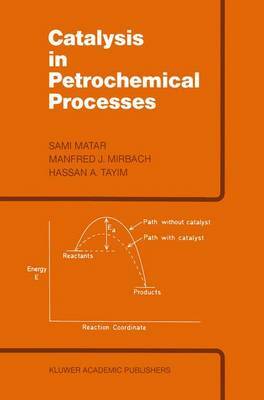 In this book, we have adopted the idea of discussing the petrochemical industry from the point of view of reactants' activities and susceptibilities toward different catalysts. The book is thus classified according to the reaction type. This will eriable students and other users of the book to base their understanding of the petrochemical field on the fundamental principles learned in chemistry. How- ever, the first chapter is aimed at establishing some basic facts on the petro- chemical industry and its major uses. It discusses, without going into details, the raw materials used, the intermediates and the downstream products. The next eight chapters discuss in some detail the main reactions and the catalysts used for the production of chemicals and polymers from petroleum. The last chapter is devoted to a discussion of some of the practical techniques used in the catalytic field.